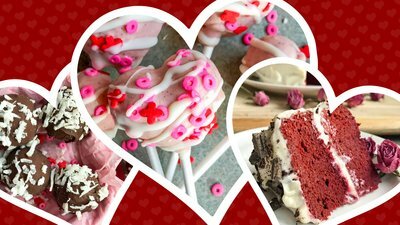 Valentine's Day is just around the corner, so why not try your hand at one of these decadent protein treats to impress your sweetheart? Your loved one will definitely appreciate the fact that these delicious goodies are much higher in protein and lower in fat and sugar than store-bought chocolates. Plus, a homemade gift is sure to impress. It's a muscle-building win-win! Whoever thought up the idea of cake balls mixed with frosting and coated in chocolate, we thank you. Even more reason to fall in love: Each protein cake pop is just over 100 calories with an impressive 8 grams of protein! If artificial food coloring and insane amounts of sugar aren't your jam, try this ultra-moist, gorgeously vibrant red velvet protein cake made with roasted beets! I promise, the beet flavor is almost undetectable and actually blends amazingly well with the cream cheese frosting. That being said, if you're afraid to try beets in a cake, just substitute an equal measure of baked sweet potato plus 1-2 tablespoons of red food coloring. Shop Protein Powders In Our Store!